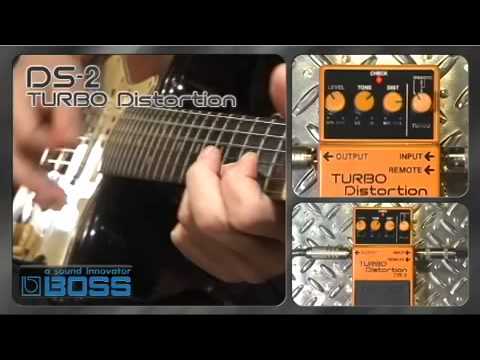 The DS-2 Turbo Distortion Pedal features twin modes for an expanded range of distortion - taking users from blues-rock rhythms to searing leads at the press of a pedal or twist of a knob. To cater to players of all genre's, the Boss DS-2 Turbo incorporates 2 different fundamental types of distortion selectable by the player. The basis for these models comes from the classic Boss distortion tone engine. Turbo mode 1 on the DS-2 produces a really warm, mellow sounding distortion coupled with a flat frequency response, perfect for a good distortion that wont mess with your EQ settings. Turbo mode 2 fires up the mid-range to deliver a biting lead tones for delivering huge solo's that will lift out of the mix. The DS-2 has an extra connection for use with a remote pedal so that you can switch between the different distortion modes without taking your hands of your guitar. This is a fantastic feature for switching between rhythm and leads with seamless crossover. The Boss DS-2 Turbo Distortion Guitar Effect Pedal is built to be gigged hard and as such, Boss have included a five-year warranty on this superb pedal. If distortion matters to you, this is definitely the right stomp-box for your rig.